The source for disc golf news in Nebraska. Tournament directors often share information about their events in the nebdisc tournament forum too. The one stop shop makes it convenient for TDs and players alike. This years list of events is shaping up. Currently with over 30 events at 18 locations, there are plenty of opportunities to meet others and compete. Locations with PDGA sanctioned events currently include Omaha, Lincoln, Seward, Beatrice and Hastings. 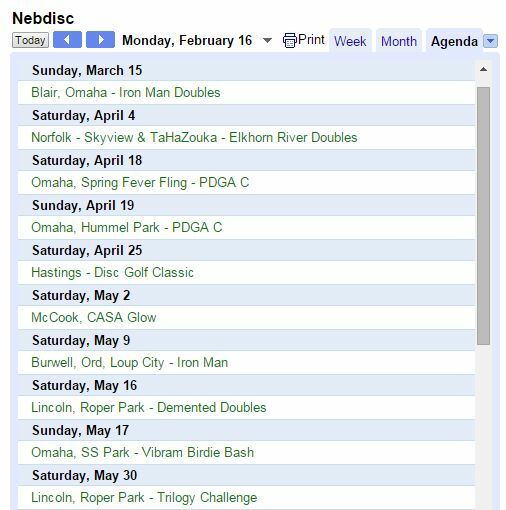 E-mail details to nebdisc@gmail.com and your disc golf event will be added to the nebdisc calendar. Disc golf is becoming an ever more popular sport. Nebdisc is here to spread information about disc golf in Nebraska and the surrounding communities. Get an old Frisbee or a long flying golf disc available from our sponsors or a sporting good stores. Find a course and enjoy the art of flying plastic around obstacles and into metal baskets.